Hopefully, you chose A. Not only would leaving on your makeup overnight not be good for your pillowcases it’s also not good for your skin. Leaving your makeup on overnight can wreck your skin by creating wrinkles, drying it out, and causing acne breakouts. Additionally, eye makeup that is left on too long can irritate your eyes and cause all kinds of infections. Not pretty. While I would sometimes nap in my makeup for an hour or so, I couldn’t bring myself to sleep overnight with it on because I knew it could irritate and break out my sensitive skin. I know properly taking off makeup isn’t a simple task. It takes a few steps and a few different products. 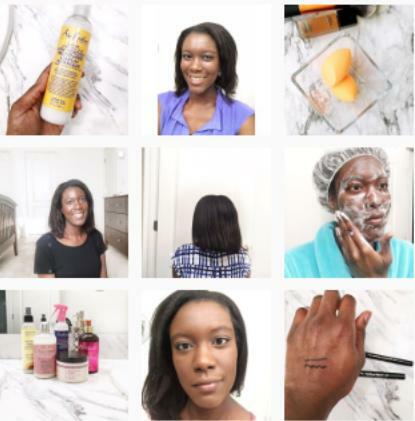 Here are the 4 steps I follow to remove my makeup every day. This is always my first step. If not it lengthens the whole process. To break down the makeup on my face I use makeup remover wipes. 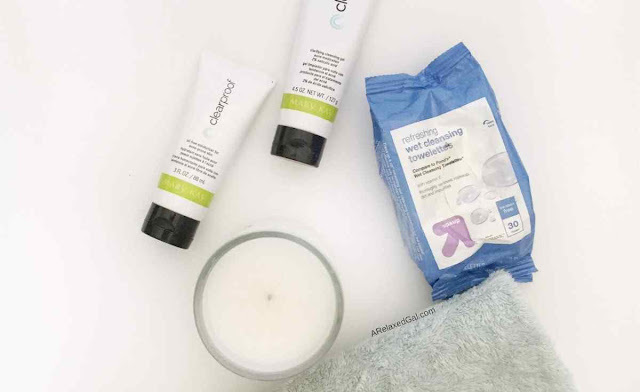 I typically use a store brand but also like the Neutrogena and Simple makeup remover wipes. If you don’t care for makeup remover wipes there are other options. Coconut oil - There are several beauty bloggers who swear by coconut oil as a makeup remover. It works well for removing waterproof makeup. Baby oil - from what I’ve seen this works similarly to coconut oil. Micellar water - this is a great alternative for those who don’t like makeup remover wipes. Some people also micellar water as a cleanser as well. Steam - leaning over a sink or bowl of steaming hot water for a while helps to open up the pores making it easier for your cleanser to remove all of the makeup. For waterproof eye makeup using an eye makeup remover on a clean cotton ball can help to make sure it all gets broken down and washed away. After breaking down the makeup probably 40-50% of the makeup has been removed. I remove the remaining makeup using a gentle cleanser that’s formulated for my oily/combination skin. 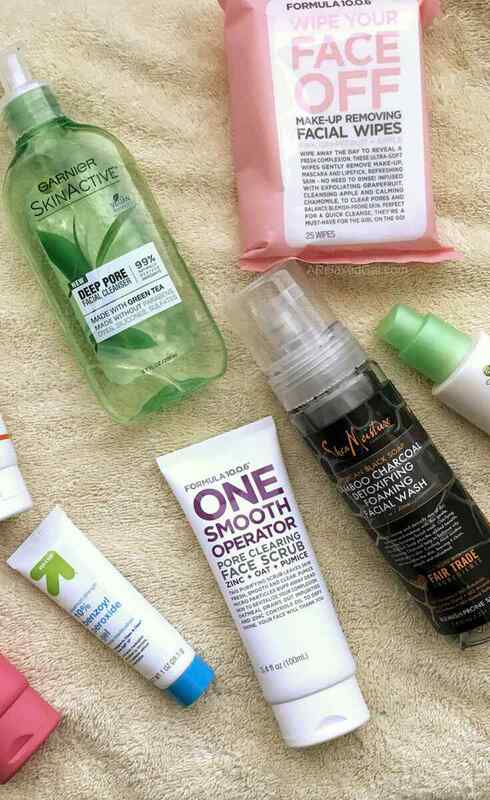 My current fave is the Garnier SkinActive Deep Pore Face Wash with Green Tea. I wash my face twice using the cleanser. I do this to make sure all of the makeup, dirt, and oil has been removed from my skin and pores. After using the makeup remover wipe and the facial cleanser my face is pretty clean. But I still like to wipe my face a few times with toner on a cotton ball. This removes any residual makeup that may still be on my skin or in my pores. My toner of preference is homemade using apple cider vinegar, witch hazel, filtered water, and rose water. To finish up I treat any blemishes using an acne spot treatment and moisturize my skin with a moisturizer without SPF that’s formulated for my skin type. Two that work well for my oily/combination skin are from SheaMoisture - the African Black Soap and Bamboo Charcoal Gelee Moisturizer and 100% Virgin Coconut Oil Daily Hydration Glow Priming Moisturizer. I try to follow this routine every night. Even when I travel. The exception might be when I do a quick overnight trip I may skip the toner and treatment parts. Outside of that, the only thing that typically changes is the products. Some products travel better than others or I may switch to products to give my skin something new. What is your makeup removal routine?